Travelling across Croatia on your own promises an empowering experience offering an abundance of freedom to explore and visit the places you really want to see. Seeing Croatia on a self drive holiday allows you to plan your own trip and spend as much or as little time as you want doing different activities. We’ve compiled a list of our top tips for going on a self-drive holiday in Croatia. Croatia is a beautiful country all year round; however, depending on what you want to see, each season has its perks. Given that you will be on a self-drive holiday, warm sunny weather is ideal; with longer days you have more time to experience different sites without feeling rushed. 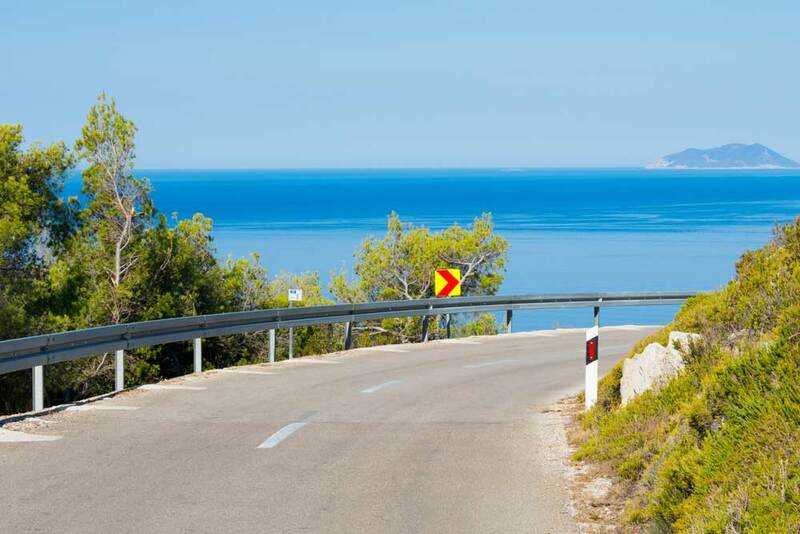 Additionally, sunny weather is optimal for witnessing the spectacular scenery while you’re driving along coastlines. Summer is the most popular time, with July and August being the peak months; we recommend planning your self-drive for May, June or September, while it’s still warm and sunny, but with fewer crowds. Winter also has its advantages. Because most of Croatia experiences a fairly mild winter, you’ll find that temperatures rarely go below 5°C. Additionally, witnessing Plitvice Lakes National Park during winter is a sight to behold, with frozen waterfalls and snow-covered trees; it truly is a winter wonderland. Furthermore, there are significantly fewer crowds in winter, which also means substantially less traffic. However the downside is the Adriatic Coast; with cold temperatures you can’t really swim in the sea and many places are closed over winter. Where should I start and end my self-drive holiday? Once again this depends on your personal preference. We advise starting in Zagreb and working your way down the Adriatic coast finishing your tour in Dubrovnik. It’s best to start with the sightseeing in Zagreb and other inland towns, and finish with relaxing days by the coast in Split and Dubrovnik. If you have time, you should try visiting the Istria Peninsula; with beautiful green landscapes, the Croatian countryside is stunning and towns like Rovinj and Pula are great for sightseeing. This honestly depends on you and how much time you have. We recommend at least 8 days if you want to see the main highlights. However, the longer the better; you could spend weeks and weeks driving around Croatia discovering new towns and beaches! If you want to spend more than one night in certain towns, you need between 10 and 15 days at least to travel across Croatia from Zagreb to most of the Adriatic coastal towns. There are countless accommodation options in Croatia, from hostels to 4 and 5 star hotels and resorts. No matter what you’re after, Croatia has you covered. However, although the options for accommodation are wide, we recommend booking your accommodation in advance to avoid the stress of trying to find somewhere to stay and potentially being left disappointed if the hotels you want to stay in are booked out. Most rental car companies have a minimum driving age of 23 and usually you need to have held your licence for at least 2 years. Make sure you have the local currency on hand at all times, because whilst big hotels and restaurants accept card and euros, many places only accept the Croatian Kuna. References: Thank you Geeky Explorer, Chasing the Donkey, Croatia Traveller.